Sielox CLASS™ (Crisis Lockdown Alert Status System) is an award-winning Emergency Notification and Response Solution that dramatically improves situational awareness, saving time and potentially saving lives. A browser-based application, CLASS is accessible anywhere and anytime using a Desktop, Tablet or Mobile Device over a WAN, LAN, WIFI, or high-speed cellular network (3G/4G/LTE) connection. 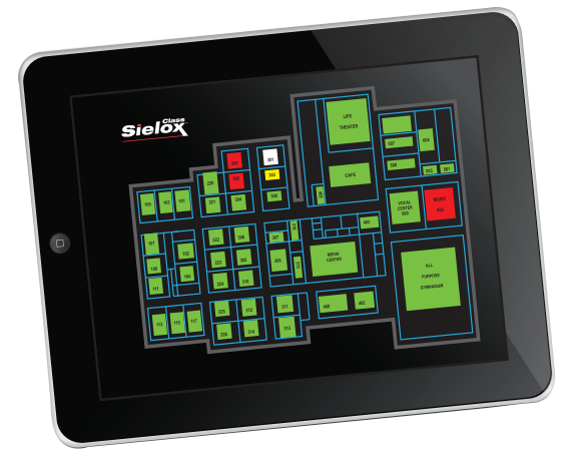 In the case of a security incident and lockdown, Sielox CLASS provides vital situational awareness to responders so they can manage the situation and avoid walking blindly into harm’s way. Administrators or any designated initiator can issue an emergency alert to notify responders of conditions in real time while communicating status via one of five programmable color-coded alert levels. Occupants within the facility can then report status at their specific location enabling responders to view detailed facility maps on a room-by-room basis with color-coded conditions that update in real time as the situation evolves. A chat feature enables two-way communications between occupants and first responders to exchange detailed information or instructions. CLASS can also issue messages with response instructions specific to each alert level via email or text, and override any PC on the network to ensure the highest visibility of alert status. CLASS is designed for stand-alone or integrated system operation. It can integrate with any system or device with an IP address providing authorized responders with the additional ability to view live cameras, change access control permissions, lock doors, and more. Initially designed for the education market, CLASS is also proving to be a highly effective resource for office, municipal, warehouse, and manufacturing facilities across a range of markets to manage all hazards, including threatening situations, inclement weather and more. Think an Emergency Notification and Response System might work for you?